On July 9, 2013, the General Assembly of Illinois roundly rejected the amendatory veto of their concealed carry weapons bill by Governor Quinn. The Governor had returned the bill to the Assembly with several suggested amendments which gun rights advocates claim would have severely restricted the bill and rendered it virtually meaningless. Rather than consider the Governor’s amendments, the Assembly wasted little time in overriding the veto, as they were up against a July 9 deadline imposed by the 7th Circuit Court of Appeals. Many legislators feared that unregulated carry would become the de facto law of the state if they did not pass their bill by the Court imposed deadline. There were numerous Democrats that choose to override Governor Quinn’s veto. They have been critical of his leadership style and governing abilities during his time in office. Many of the downstate Democrats claim that Quinn’s veto was a purely political move, saying that he was pandering to his base of voter support in Chicago and Cook County. But even some Chicago Democrats voted against Quinn’s proposals, mostly based on the aforementioned fear of unregulated carry in the state and cities. Democrats who are in favor of stricter gun control have vowed to bring up Governor Quinn’s proposals at a later date, and say the debate on concealed carry is not yet over. Critics of the concealed carry bill say that it is the most restrictive law in the country. Gun owners who want to obtain a CCW permit must be at least 21 years old, already have a Firearms Owner Identification Card, undergo rigorous criminal and mental background checks, successfully complete 16 hours of training in the classroom and on a range, and pay a $150 fee for a 5-year permit. Any convictions or guilty pleas for misdemeanors of a violent nature will disqualify an applicant, as will a history of drug or alcohol related vehicular offences. Any person who has been adjudicated as mentally deficient, or has been treated for drug or alcohol addiction within the last 5 years will also be disqualified. The bill would require all law enforcement and health organizations to report anyone who has been deemed mentally ill to the State Police. There is no reciprocity with any other state’s concealed carry permits. 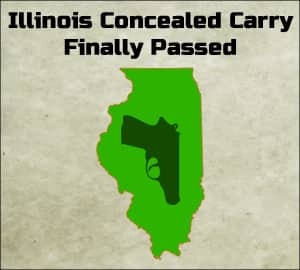 As such, any person who is not a resident of Illinois that wishes to carry concealed in the state will have to go through all of the same process as state residents and pay $300 for a 5-year permit. Some of Governor Quinn’s proposed amendments to the bill were to restrict concealed carry permit holders from carrying more than 10 rounds, limit them to carry only one gun, and to prohibit carrying in any establishment that serves alcohol. The law stipulates that concealed carry will be allowed in restaurants as long as alcohol sales make up less than 50% of all sales. As the law is written there are already numerous places that carrying will not be allowed, including any government property, schools, mass transit, and large gatherings. These places will not be compelled to display signage denoting they are “gun free zones” unless they chose to do so. The Illinois State Police have 180 days to set up the process for granting permits and begin accepting applications. Once an application has been received, the ISP has 90 days to grant a license. Any law enforcement agency in the state has 30 days once an application has been received to file an objection. The ISP has 60 days to begin the process of licensing firearms instructors and approving training courses. They have set up a website with all of the information needed, and will continue to update it as more information becomes available. In the meantime, gun owners cannot carry until they have obtained a permit, even if they already have a FOID card. Any gun owner caught carrying a firearm without a valid CCW permit will be arrested and prosecuted under the old laws. Current statutory code states that carrying a concealed weapon will result in a Class 3 or 4 felony, depending upon location. Here at USA Carry, make sure to check out our Illinois Concealed Carry information page about Illinois’ new concealed carry permits. On this page you can easily find all of the requirements and qualifications for a permit. You can also see a wide variety of frequently asked questions. The page will be frequently updated as new information becomes available. A similar page is also available for every other state’s concealed carry information. You can also find our Concealed Carry Permit Reciprocity Maps that show reciprocity between the various states and where your particular state’s permit will be honored.